Brooklyn Navy Yard No. 12 is an 0-4-0T (no pilot wheels, four drivers, no trailing wheels; tank engine) steam locomotive built in 1918 by the Vulcan Locomotive Works in Wilkes-Barre, Pa. The sprawling shipyards and dry-docks covered more than 200 acres of Brooklyn waterfront, and trains were used to move materials throughout. No. 12 received a new boiler in 1931. Near the end of the steam era in 1947, No. 12 was acquired by the Dexter & Northern, a small industrial railroad that was operated by the Dexter Pulp & Paper Company near Watertown, NY. While there it was given a new set of flues in 1955 by contract with the nearby New York Central repair shops. Upon the closure of the railroad, No. 12 was purchased by the Smith family and moved to their Skyline Amusement Park in Tioga Center in the 1970s. 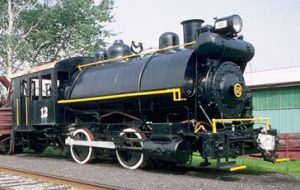 After the park closed, No.12 was purchased by James Mead and was later moved to the Tioga Transportation Museum in Flemingville, N.Y., just a few miles north of Owego. 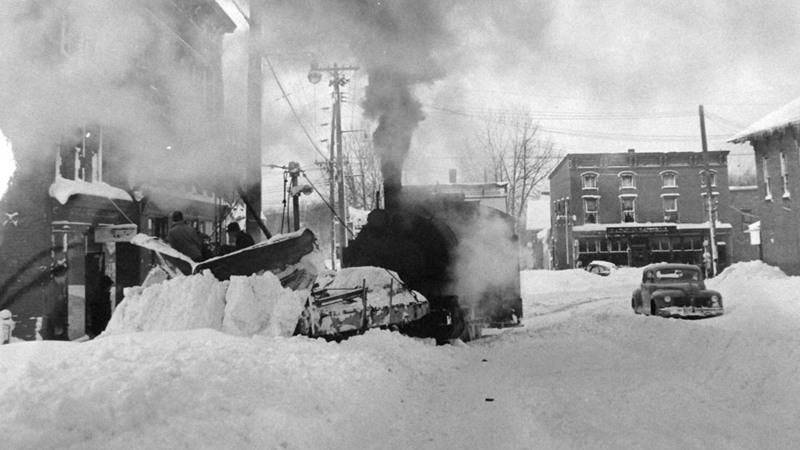 Occasional operation of a private siding took place on Sundays from 1971 through 1991. Following the loss of a boiler tube, the locomotive was stored on the siding before being donated and moved to the museum. On November 4, 1997, a crew from the museum, with help from Mendon Enterprises Trucking, headed to Flemingville to load and move No. 12 to Industry. This type of locomotive is called a “saddle-tank” engine because it carries its water supply in a special curved tank curved over the boiler. Coal supplies are carried in a bin located right behind the cab. Small industrial engines like these did not travel long distances, so they were never far away from fuel supplies if they needed to be replenished. While the museum has no immediate plans for restoration or operation, an extensive evaluation of the boiler was professionally made to help guide any future rebuilding efforts. The locomotive is currently disassembled and stored inside our shop, and is not on display to the public. Vulcan Locomotive Works, Wilkes-Barre, Pa. It is August 1988 and we find the R&GV Railroad Museum’s ex-BNY Vulcan #12 0-4-0T steam engine in service at the Newark Valley, NY depot. Hear #12 blow for a grade crossing and pass us with a coach and caboose in tow. Taken from a video tape shot in 1988 of #12 in service. Moving BNY #12 – Part 1: Loading up! Without a locomotive to shove the locomotive on to the trailer, a block and tackle system was used to pull the locomotive on a trailer..
We see the engine arrive at the museum, the trailer positioned, and then the engine pulled off of the trailer using the museum’s General Electric ex-Rochester Gas & Electric 45-tonner locomotive #1941.